This is so creative and beautiful. I also use markers and mostly pen to draw the outline on any character I draw. 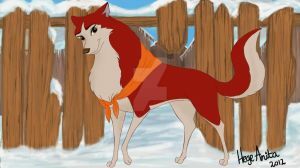 You do not mine on checking out my Balto and Jenna artwork? I like this style, especially that bottom left image. Something about it, I don't know, it just looks awesome. Great job! Those eyes are a bit Anime like. She looks pretty good here, nice job!